Any Video Converter Ultimate is an all-in-one Video Recorder, Blu-ray Discs & DVD Converter, Video Converter and Audio Extractor, Any Video Converter Ultimate can easily capture streaming videos, DVD Movies, online videos & TV shows, iTunes videos, etc. It also supports ripping DVD and converting video to popular video formats. 2. How to Rip DVD Movie? 3. 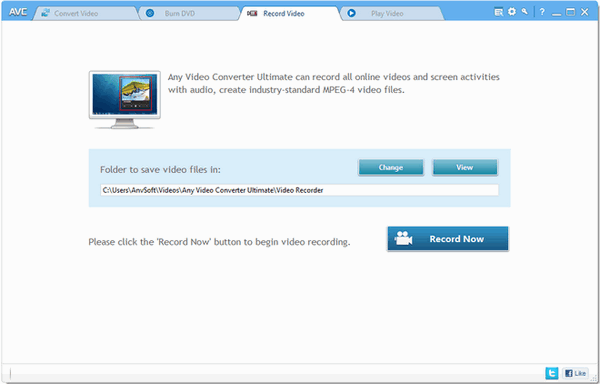 How to Record Video with Any Video Converter Ultimate? Step 1. Run program, click "Record Video" tab on the top of the program to the video recording panel and click "Record Now" button to start recording. Step 2. Play video to record. Step 3. The recording region can be detected by program automatically. Adjust video record region by dragging manually if necessary and set stop time if needed. Step 4. Click "REC" Button or press hotkey Ctrl + F7 to start recording. 4. How to Burn Videos to DVD? b. Any Video Converter Ultimate supports various DVD media including CD-R, CD-RW, DVD-RAM, DVD+R, DVD+RW, DVD+R Dual Layer, DVD-R, DVD-RW, DVD-R Dual Layer, random access writes and more.